Spot Favourites brings together the two popular videos of the Adventures of Spot and Spot goes to the Farm. The world that Spot lives in is a gentle one where kids can learn simple lessons about friendship, sharing and having fun. There are 16 episodes on this DVD, making it run for a very robust 96 minutes. Each little tale is simple and entertaining in it's own way. The best thing about this series is that it stays true to the spirit of the learning to read books also starring Spot. Your younger viewers are going to understand every episode featured which is an achievement in itself. The animation style in Spot is delightful and very cute. Kids are going to love the drawings and identify with the characters. 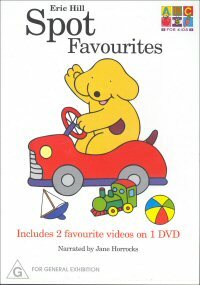 I'd certainly have no problems recommending this jam packed little DVD to anyone with younger children. A favourite episode with my kids was Spot Goes to the Circus where a seal taught Spot how to balance a ball on his nose! Made for TV, no problems at all and a delightful series of animations. My kids loved the music that played throughout, particularly the title music.